This Grishko model has been designed for all kinds of foot. It has a medium flat platform and a U-shaped vamp with a cotton drawstring. 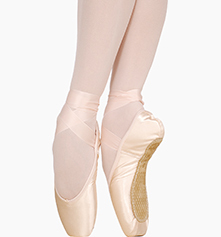 The specially designed extra light model with a suede machine-stitched sole provides an easy transition from Demi-Pointe to Pointe and back. The shoe has perfect balance and placement, and outstanding durability and comfort.